That New York Acadamy report claims: there were Chernobyl: A Million Casualties on this EnviroVideo presents Enviro Close-Up with Karl Grossman. Dr. Sherman is interviewed on the 25th anniversary of the Chernobyl meltdown. Joseph Mangano is an epidemiologist, and Executive Director of theRadiation and Public Health Project research group. Veterans Today: Fukushima Radiation 1000 Times H-Bomb Peak | Veterans Today Dr Janette Sherman, a highly respected physician and an acknowledged expert in radiation exposure, has estimated the world wide Chernobyl Kill to be at least one million people killed to date. Just six days after the disastrous meltdowns struck four reactors at Fukushima on March 11, scientists detected the plume of toxic fallout had arrived over American shores. Subsequent measurements by the U.S. Environmental Protection Agency (EPA) found levels of radiation in air, water, and milk hundreds of times above normal across the U.S. The highest detected levels of Iodine-131 in precipitation in the U.S. were as follows (normal is about 2 picocuries I-131 per liter of water): Boise, ID (390);Kansas City (200); Salt Lake City (190); Jacksonville, FL (150); Olympia, WA (125); and Boston, MA (92). EDITOR'S NOTE: A streaming audio replay of a related news event will be available on the Web at http://www.radiation.org as of 4 p.m. EST/2100 GMT on December 19, 2011. Embargoed copies of the medical journal article are available by contactingAilis Aaron Wolf, (703) 276-3265 or aawolf@hastingsgroup.com. On several web sites there has recently been references to an article published on the web site Counterpunch with the title “Is the Dramatic Increase in Baby Deaths in the US a Result of Fukushima Fallout? – A 35% Spike in Infant Mortality in Northwest Cities Since Meltdown“. But why are the 10 weeks after Fukushima compared with only 4 weeks before? There seems to be a reason for it, commonly referred to as cherry-picking, i.e. you select the data that supports your theory without showing the full picture. To show the full data set may falsify what you want to show. This is quite common in politics and by people who have an agenda that is more important than the truth. But here we have two persons in medicine, one Medical Doctor and one Master of Public Health, they should be trustworthy professionals who are keen on giving people honest information, right? Let’s check their deck of cards closer. 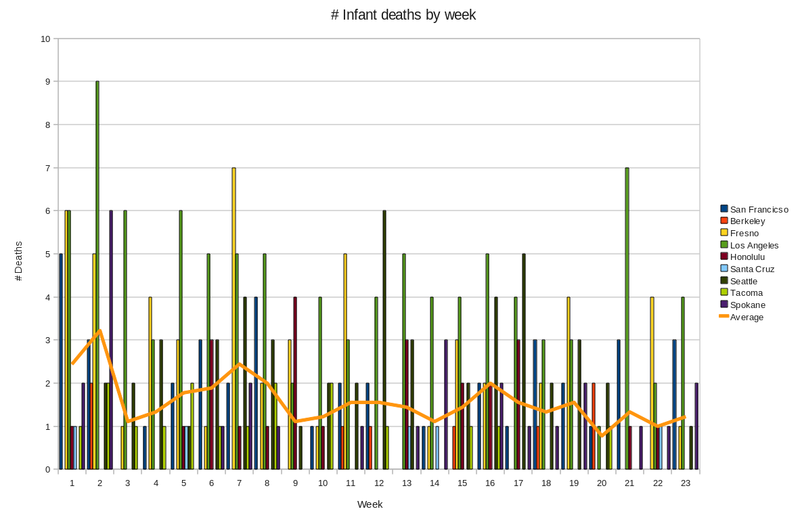 Very interesting, the first seven weeks of 2011 actually has higher infant mortality than the weeks after Fukushima, quite different from what Sherman and Mangano wants us to believe. There is no spike after Fukushima, instead there is a dip during the 4 weeks before! A more detailed report on the closer scrutiny of Sherman and Mangano’s article is found in our Deep Repository. Joseph Mangano already has a track record of handling data in not so honest ways, we may come back to that in other blog entries (a few links to examples, as requested by a commenter: http://neinuclearnotes.blogspot.com/2005/08/joseph-mangano-and-art-of-deception.html andhttp://www.nei.org/resourcesandstats/documentlibrary/safetyandsecurity/factsheet/scienceonradiationhealtheffectsdispelstoothfairyproject/). Preview some of the top shows you shouldn't miss on PRN this month! The article, published on 10 June 2011, is authored by Janette D. Sherman and Joseph Mangano, ... So, why does a Medical Doctor mistreat official data in this way? By JANETTE D. SHERMAN, MD and JOSEPH MANGANO . U. S. babies are dying at an increased rate. Not going to be easy to find. This article is a couple of years old, but shows an increase in infant deformities (and the difficulty of accurate figures) in Iraq. Because of the the high level of testing in western countries, many deformities are found very early in pregnancy. The real number would be evident in areas where pre-natal testing is limited - these same areas would also have less accurate record keeping though. The Source is an anti American, Pro Muslim Web Site, now let me see should I believe it or not ?, NOT ! A provocative new study released this week suggests as many as 14,000 Americans may have died as a result of exposure to radioactive particles blown here from Japan after the Fukushima nuclear reactor meltdown in March. But even though the report is gaining some attention, experts say there is no scientific basis for its claims. Drs. Joseph Mangano and Janette Sherman, writing in theInternational Journal of Health Services, proposed that there were 14,000 “excess” deaths in the U.S. following the accident at the Fukushima Daiichi nuclear plant in Japan, due to the release of a plume of radioisotopes over 5000 miles away. This theory is preposterous on so many levels that I don’t know where to start. The “study” found that during the 14 weeks following the accident, death rates in 104 U.S. cities were about 2 percent higher than those for the 14 weeks before the accident, constituting about 3,300 “extra” deaths. Applied to the entire country, this number rose to 14,000. Right away this smelled fishy. But that didn’t stop Mangano, as quoted in MedPage Today,from concluding that the finding is “a clarion call for more extensive research.” No it’s not—it’s a clarion call for some common sense. The only two (barely) conceivable ways that such a plume could kill anyone are cancer or radiation poisoning. Cancer can be ruled out immediately, since there is no way it could even begin to develop in such a short period of time, let alone kill anyone. Cancers take years, or even decades, to grow—not weeks. And, almost all of the radioactive material released was iodine-131, associated with thyroid cancer, which is one of the slowest growing and least deadly cancers.